Each November, Curtis Granderson and the Grand Kids Foundation host GRAND GIVING – a national food insecurity campaign and fundraiser that has donated more than SEVENTEEN MILLION MEALS to children and families in need. Food insecurity impacts 48.8 million Americans – including 13 million children – who don't always know when their next healthy meal is coming. Millions of underserved children in the United States start their mornings without breakfast, end their days without dinner, and struggle through summer breaks without a single healthy meal. Grand Giving supports food insecurity initiatives that provide free meals to children who need them most. Your donation matters. Join us in the fight against hunger. WANT TO GET INVOLVED AS A PARTNER? Each year, the Grand Kids Foundation and partners turn dollars raised into meals served as part of the month-long campaign. Every penny raised directly benefits our Food Bank partners. 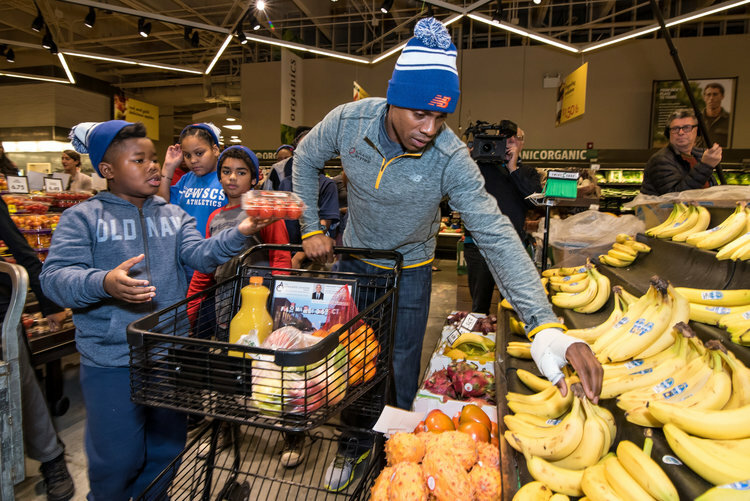 The month-long program hosted each November originated in Curtis Granderson's hometown of Chicago with partner grocery store Mariano's. Curtis founded the initiative after a series of camp programs inspired him to extend his community investment beyond education and athletics to nutrition and food insecurity. By 2018, the program has raised 17M meals for children and families in need. It has also expanded nationally to include a Day of Service tour, with in-person and digital engagement campaigns. Curtis Granderson is considered one of the most philanthropic athletes in professional sports. The three-time MLB All Star, Roberto Clemente award winner, and founder of the Grand Kids Foundation (est. 2007) also served as a spokesperson for the White House’s Let’s Move anti-obesity campaign and the Partnership for a Healthier America’s Drink Up (H20) initiative, and an International Ambassador for Major League Baseball. With a legacy of more than a decade of positive impact, Grand Kids was founded by Curtis Granderson in 2007 to provide educational and athletic opportunities to children in need across the country. With coast to coast events including Grand Giving, The New Balance Fitness Challenge, Citi Community Home Runs, Little League Sponsorships and youth baseball programs, thousands of children benefit each year from programming hosted by Curtis and the Foundation. "Each and every one of us can knock hunger out of the park"